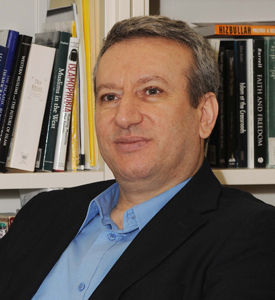 Jusuf Salih completed his Ph.D. in Religious Studies at the University of Virginia in 2011. His dissertation was on the politico-theological thought of Mustafa Sabri Efendi (1869-1954), one of the last Shaikh al-Islam, the supreme religious authority of the Ottoman Empire. In 2012, Dr. Salih joined the Department of Religious Studies at the University of Dayton. His primary teaching at the University of Dayton is in Islam. He has taught Introduction to Religion, Introduction to Islam, World Religions, Islam in the Modern World, Islam in Europe and North America, and Comparative Mysticism. The purpose of teaching religion is to open the doors of dialogue and mutual understanding among members of different religious traditions. I want to build bridges between these traditions for the betterment of the world. Teaching religious studies gives me the opportunity to intensify hope and courage in my students. I want to help people see the common human values that are shared among religions by emphasizing the how religions can connect people rather than divide them.